The Boy and I moved into our now-not-so-new place in April and I'm contemplating a little redesign project before winter. I've been looking for inspiration for a sitting room theme and came across this image: isn't this the coolest table ever?! Not sure I'd trust it with my cocktail hour martini, but it sure looks good! I'm still trying to work out how it's even possible.. but I do love it. It's fantastic, isn't it! 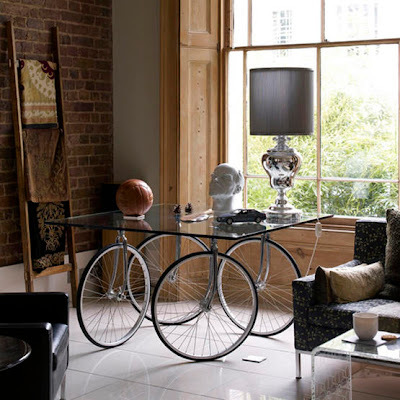 I love the styling of the whole room, really: a good mix of classic, contemporary and crazy!